Just wait 'till you see what the little bombs split up into. Oh God. Even the bullets shoot bullets. There's Abnormal Ammo for those cases when your weapons fire something unusual. But what if your weapon fires stuff... that also shoots projectiles of its own? That would be cool, right? Recursive Ammo is what happens when ammunition for a certain weapon uses another level of weapons to do the dirty work. In Real Life, the secondary ordnance is called "sub-munitions". This does not include things such as fragmentation grenades, Attack Drones, or missiles with multiple thrusters that break away. Various forms of Real Life versions of these weapons will show up anytime someone decides to look up modern weapons. Bullet Hell games in general tend to make use of this trope, as interesting patterns and changes of direction of bullets is their bread and butter. Can be one of the three different types of Spread Shot and frequently a way to instigate Splash Damage. Sub-Trope of Abnormal Ammo and Matryoshka Object. See also Improvised Scattershot when this happens through external forces. Code Geass has a unique Humongous Mecha in episode 8 called the Raikō that uses a massive railgun that fires shells that split into several dozen pellets, each "pellet" being roughly the size of a tennis ball. Earlier on, there was a one-off Knightmare weapon called a chaos mine which is thrown like a grenade but at the top of its trajectory, it opens up and releases a sustained barrage of pellets on the target from above. Euphemia almost gets killed by one but as it turns out, chaos mines are ineffective against the Lancelot's Blaze Luminous. Cowboy Bebop, episode "Gateway Shuffle": a group of insane ecoterrorists launches a large bomb toward a moon. As our heroes near it, it opens and releases three missiles. Two are destroyed by Spike, and just as he's about to destroy the third, it splits further into a thousand tiny rockets. In Dragon Ball, Krillin uses a Ki Attack variation of this where he throws an energy ball into the air which then breaks apart raining death on all those below. 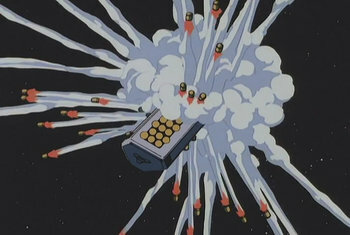 Mobile Suit Gundam SEED had various battleships and such that fired missiles into the air, which would then fire a rainfall of shrapnel to cover the enemies. It's been one of the most successful tactics for heroes and villains alike. Mobile Suit Gundam: The 08th MS Team has a similar weapon fielded on Zakus as anti-infantry measures. When a bunch of guerrillas charge at a downed Zaku, the pilot fires three of these into the air. Two are shot down by small arms fire but the third explodes into a brutal rain of shrapnel that shreds the entire guerrilla force in a second. The Zeon Xemel mobile suit that bombarded the base in the first episode also fires cluster munitions. Combattler V BIGGU BURASUTO! DIBAIDAAAA!!! Full Metal Panic! pulled this off in The Second Raid season premier: when the Arbalest is retrieved by the Tuatha De Danaan, the sub fires several cluster missiles onto the tanks lining the riverside. The entire army gets wiped out in seconds. Mobile Suit Gundam 00 Ali al-Saachez's custom Enact has a rifle attachment that launches a micromissile-launching missile. Then there's the mobile armor in Gundam 00: A Wakening of the Trailblazer, which has GN Fangs that themselves launch smaller GN Fangs. These are, in turn, based on the "Mother Funnels" carried on the back of the Gaymark from Mobile Suit Gundam ZZ. Evac's missiles in Transformers Cybertron, opening up to release a zillion smaller missiles. Banner of the Stars has antimatter mines that, when shot at by point defences, split into even more mines. These mines disguise themselves as the debris of the destroyed mine, and then jump any Abh spaceship that strays too close. Transformers comic, Blustreak uses a missile like this as one of his signature weapons. During Judge Dredd's "Apocalypse War" arc, Sov regular nukes consist of a large missile that breaks up and launches multiple nuclear warheads (a MIRV), scattering them across the Big Meg. As described in listicles as one of his more ridiculous ones, Green Arrow has an SOS Trick Arrow that fires nine arrows in sequence. Three short one, three long ones and three more short ones. Iron Man: The Jericho missile at the beginning splits up and proceeds to simply level a small mountain. The Avengers: A miniaturised version of the Jericho (from Iron Man) is shown as part of the suit's arsenal, used to take out multiple Chitauri. Hawkeye also uses an arrow which embeds itself in one of the Chitauri and then releases a spray of projectiles into several others. Star Trek (2009) The missiles of the Narada which break open and deploy warheads. Spawn starts with Al performing an assassination with one of these. Who Framed Roger Rabbit: Eddie Valiant has a Toon revolver (given to him by Yosemite Sam) that fires Toon bullets - each one a different western stock character, each one then taking on their target with their own weaponry. Although they're pretty much the opposite of smart ammunition, demonstrated when a bunch of them hare off in the wrong direction. Of particular note is the bullet that worked right when it shattered the liquor bottle. It whipped out an axe (or tomahawk) to shatter the bottle. Night Watch the film Day Watch, there is an aluminum foil ball attached to a rubber band. If thrown, it unfolds in midair and splits into three identical, but faster and harder, balls, which also split, etc. It devastates Moscow in one strike. Hansel & Gretel: Witch Hunters. The Action Duo leave one of their anachronistic rifles with a Kid Sidekick they've picked up on the way, and he uses it to shoot at the Big Bad as she's zooming by. Cue Bullet Time shot of the bullet unraveling in mid-flight to spray pellets in a make-shift Anti-Air projectile that shoots down her Flying Broomstick. In Tom Clancy's The Bear and the Dragon, United States F-16s deploy 192 J-SOW (nicknamed "Smart Pig") missiles against a Chinese force of about 1000 armored targets, mostly tanks. Once close enough to their targets, the J-SOW missiles each deploy 20 smaller guided munitions with anti-armor capabilities that quickly destroy enough of the enemy vehicles to render the Chinese force irrelevant. The AGM-154 JSOW Joint Standoff Weapon is the real joint United States Navy/Air Force weapon system on which the Smart Pig is presumably based. It has been a great success and has been in use since the 1990s. Clancy's version is similar in function to the real one, though likely more effective than is realistic in order to move the plot along and to reinforce the theme that the United States military is too powerful to fail. In David Brin's Uplift series, some of the more advanced Galactic missles have multiple layers to them. In Startide Rising, the Soro fire missiles at a Synthian scout. He fires anti-missile missiles at them, and the missiles shoot them down with Beam Spam! Night's Dawn Trilogy, starships launch "combat wasps", which in turn launch "submunitions". Honor Harrington features missiles that shoot several dozen laser beams in a shotgun-like spread, powered by a small nuclear warhead. This is based loosely on a Real Life concept; see below. Loosely speaking, the series contains spaceships that launch pods which then launch multistage missiles that are capable of spraying lasers everywhere. Dale Brown books since Fatal Terrain include the submunition-laden Wolverine cruise missiles. In addition, various UCAVs, although meant to resupply from a mothership and go for more attack runs, mount warheads of their own just in case. In Banner of the Stars, the United Mankind develop a new type of mine (other sci-fi series would probably call them torpedoes), which can divide into four independent mines to overwhelm point defense guns or lie in wait in debris fields until a ship passes by. They're dealt with by deploying More Dakka. In Harry Harrison's Northworld series, mention is made of shield penetrating bullets that hit a shield then fire another shot at the same now weakened spot, up to twice. note (original shot from gun, bullet hits shield and fires second, second hits shield and fires third.) This is probably also inspired by a Real Life weapon, the explosively formed penetrator. In Harry Turtledove's World War, cluster bombs are one of the modern-era weapons unleashed on World War II-era Earth by The Race. It takes a while for the contemporary soldiers to get used to them and several are crippled by bomblets blowing off one of their feet. Fortunately for humanity, they're also one of the weapons the Race only has a very limited supply of. Fyodor Berezin's novel Ash features orbital defense railguns that automatically target incoming missiles. Then we find out that there are even larger railguns that launch those smaller railguns. On the other side, many of the missiles launched from the planet are multi-stage MIRVs, releasing thousands of warheads and even more decoys. Some of the missiles are cluster bombs where each bomblet is a tiny nuke that uses californium (which has a smaller critical mass than plutonium). Many artillery shells used in Hammer's Slammers. Such as anti-personnel "firecracker" rounds that scatter a bunch of small bomblets over an area. Or the anti-tank shells, which detonate above the target and impale it on a jet of molten metal. In Jules Verne's The Begum's Millions, one of the munitions developed by Prof. Schultze was a shell packed with a hundred of small cannons which, in turn, fired incendiary bombs after release. Stargate Atlantis introduced the Horizon which is a starship deployed MIRV (explained below). Thunder LRMs are essentially missile-deployed minefields, which even come in a variety of distinct types. FASCAM (see the Real Life section below) and cluster rounds for proper artillery weapons also exist. GURPS: Ultra-Tech has Smart Explosively Forged Projectiles that fly over the target before using the explosive force of the warhead to create a flaming armor piercing spike. Star Fleet Battles drones (missiles) include multi-warhead capacity, such as Starfish drones and swordfish drones which fire a phaser at the target. Transhuman Space has military spacecraft launching "Autonomous Kill Vehicles" (AKVs), which are basically robot fighters with guns installed — except that they also capable of ramming if the situation justifies it, bringing them into this category. The Manticore Multiple Rocket Launcher has, as its most common armament, a rack of 4 (and only 4) Storm Eagle rockets. A Manticore may only fire one Storm Eagle per turn, and each Storm Eagle breaks into a barrage of 1-3 mini-rockets once the main Storm Eagle reaches the apex of its trajectory. Due to their temperamental nature, Manticores are sometimes distrusted by commanders, but having that kind of potential in firepower makes up for it. The stormshard mortars fitted to Wyvern Suppression Tanks fire shells designed to explode above enemy infantry, showing its victims with countless razor-sharp, aquila-shaped flechettes that scythe through flesh and bone with ease. One Whirlwind missile in some editions of the game is a missile that deploys mines when it goes off. Ordinatus Golgotha, from the 2nd Edition of the Epic scale version of the Warhammer 40'000' game system, is armed with six enormous Hellfire Missiles, each of which is fitted with multiple warheads that separate before impact so that the war machine can devastate a large section of the battlefield with a single shot. It was built specifically to deal with a gigantic Ork horde, at which it excelled, and since then it's been one of the most used Ordinatus weapons, as anything that can blanket a giant horde in explosions never gets old for the Imperium. Mekton Zeta, in the Tactical Display, encourages faking this by purchasing a Remote and packing it with as many missiles as you can afford. Because a Macross Missile Massacre is the only way to effectively use missiles, you may as well fire off as many as possible in one round. Touhou: Fairly rare, but present. More common is mobile bullet spawn points. Ketsui: Most of the final fight has bullets firing other bullets, or turning into other types. I even tried making bullets that shoot bullets that shoot bullets that shoot bullets that shoot bullets, but that turned into way too many bullets and went out of control. The most common example are MIRV mods for grenades, which are essentially cluster bombs. Explosive Rain ones are the same, except they jump way up and rain down a number of bomblets, as the name indicates. Due to their large blast areas and high damage potential, these Recursive Grenades are often the best grenades available. Anarchy-type submachineguns fire multiple bullets per bullet drawn from the magazine  two bullets per trigger pull, each worth two individual bullets. The tradeoff is poor accuracy. A rocket launcher called 'The Mongol' shoots rockets which shoot MORE ROCKETS. Bouncing Betty grenades, which launch themselves to chest height and then fire a radial pattern of explosives. S&S Orion: Aside from doing massive shock damage, the bullets split into 3 smaller fragments upon hitting a wall. The legendary Tediore "Deliverance" shotgun is particularly weird: once thrown, it homes in on a target while shooting before it explodes. The bullets aren't coming out of the magazine (it still happens if you ran out of ammo), they just... exist. There's always the Torgue-made MIRV legendary, the Bonus Package, and its Seraph counterpart, the Meteor Swarm. For when the entire room has to die, it's a standard grenade that spawns up to 12note for the Meteor Shower; the Bonus Package maxes out at a slightly saner 10 more grenades, which each spawn another grenade when they explode. The main downfall of this abomination is that the player tends to get caught in the murderstorm as well. Also by Torgue: The Unkempt Harold, a Legendary pistol whose explosive bullets split into three, then five, then seven projectiles in a straight horizontal line. Made even better when it has its "Double Penetrationg" double shot prefix. Again by Torgue: In Tiny Tina's Assault on Dragon's Keep, SWORDSPLOSION!! !, a shotgun that shoots a sword that blows up into three more swords. It's less a shotgun proper than it is a Grenade Launcher capable of criticals and whose "grenades" are MIRV's. Highly unusual, highly deadly, highly useful. Hyperion even gets in on the action with the Conference Call shotgun. The pellets shot fire more pellets in a horizontal perpendicular path either at intervals or when it hits a surface or enemy. Another Hyperion gun that can potentially do this is the Fibber pistol. If the version generated has a particular barrel, the pistol bullet will break into nine shotgun pellets upon hitting an inert surface and ricochet in a parabolic arc. The pellets hit for the full damage of the original bullet. As the weapon card doesn't have a multiplier attached, each of the pellets get the full damage amplification from Hyperion amp shields (including their Legendary, "The Bee"). Because of the shift in ammo types with this variation, a Gaige character with the Close Enough skill can have the skill activate and not lose half the damage it would normally lose. With enough Anarchy stacks, this pistol can become a Game-Breaker. Razing Storm: The Giant Spider Tank fires missiles into the air as a Last Ditch Move. The missiles start homing in, then shoot out even more homing missiles. However, it's not aiming for you- it's aiming for the mid-air platform that you're on. One of the Chinese Support Powers in Generals is a plane that drops a bomb... that spreads mines. Also see the Real Life example below. Tiberian Sun: Missile Silos... with Multi Missiles! Red Alert 2 allows this with Prism Tanks. Since they're not equipped to combine their beams into one super-powered beam like the larger Prism Towers, they instead have their lasers scatter on impact. With sufficient experience, a single one of them can attack a lone tank or sentry gun in an enemy base and end up destroying or severely crippling half of that base. Red Alert 3 arms MiGs with appropriately-named Matryoshka missiles. Worms has clusterbombs and bananabombs. The latter is more fun. And the Sally Army. A wandering Salvation Army Action Bomb which explodes into exploding tambourines. Yes. Jet Force Gemini features clusterbombs that detonate on contact and scatter in 3 smaller bombs. The smaller bombs also explode on contact, but to prevent them from exploding almost instantly, they deploy umbrellas to float gently to the ground. Iji has Tor's attack Fractal Rockets. The Crusader series of games has an AR-7 rifle, which upon firing one shot fires five micro-rockets. It's like a shotgun that fires missiles. Shotgun Ice in Mega Man X will break into chunks upon hitting something. Spread Drill in Mega Man & Bass splits up into two smaller drills up to two times when you press the fire button after launching it. In Mega Man 8, the Arrow Shot upgrade splits into 5 bullets in a spread formation when it hits an enemy. Into the Void, an obscure 4X, has missiles that fire lasers. Descent has the smart missile, the earthshaker missile and the cyclone missile. The smart mine applies this trope to a stationary mine which releases Friendly Fireproof homing shots when triggered. From a gameplay physics perspective, some other Descent 3 weapons behave like this: the frag missile (which effectively releases Hyper-Destructive Bouncing Balls), the napalm rocket, and strangely enough the impact mortar (its explosion is actually caused by a second weapon spawned when the mortar's timer expires). Since Descent 3 weapons don't spawn submunitions when they impact something other than terrain, it means you can use the impact mortar on an enemy point blank without blowing yourself up. Ace Combat 6: Fires of Liberation's final superweapon Chandelier is a giant cannon with shells that break up into dozens of cruise missiles near the target. In an example that the player can use, regular cluster bombs, the Self-Forging Fragment Sub-munitions bomb( SFFS) and the Stand-Off Dispenser (SOD), all based on real weapons. The bombs used in airstrikes for Modern Warfare appear to be clusterbombs based on the way the missile casings fall and the dispersion pattern as well. Call of Duty: Black Ops has a secondary grenade in the form of a Matryoshka doll in its version of Nazi Zombies. Call of Duty: Black Ops II (and every COD since then) has a killstreak in multiplayer where a controllable missile being dropped onto the map can be split into multiple missiles which can hit multiple targets. Armored Core has multi missiles. Demonstrated by 4A's opening animation. To be more precise: White Glint with a VOB fires off a big missile. The big missile's case breaks open and reveals and releases several smaller missiles. Team Fortress Classic has a grenade that explodes into even more grenades as part of the Heavy Weapons Guy's and Demoman's arsenals. Team Fortress 2 limits this for balance's sake—the only instance that appears in the game is the Pumpkin Bomb MIRV spell from the Helltower Scream Fortress Halloween update. The spell fires a pumpkin bomb that travels like a grenade and explodes when it lands, forming a minefield of six smaller pumpkin bombs that have to be detonated by firing on them yourself. If the enemy sees the field, the pumpkins can be easily destroyed at range, like sticky bombs. This tends to make it more useful for faster, sneakier classes than any of the heavy hitters. Sword of the Stars has the Multi-Warhead Missile. The sequel adds extra options such as an Honorverse-style bomb-pumped Heavy Combat Laser, a variant of the previous that fires multiple X-Ray Lasers instead, as well as a third that releases an Armour Piercing Heavy Driver shell. Mutilate-a-Doll 2 has Gun Gun. It shoots guns. In the Hunt has a green powerup gives your submarine these. Custom Robo has a few guns which do this. One fires a missile which breaks into five homing missiles, and another fires a spike of energy upward that splits into more, pauses, then comes down. There's a few more along the same lines. FreeSpace includes some bombs and missiles that'll spread either guided or unguided warheads when exploding - such as the Inferno or the Shivan Cluster Bomb. FreeSpace features Subspace Missiles too - but that's a bit different. You send a Tag'ing missile (or eventually paint the target with a laser) - which spawn plenty of missiles from subspace to crash on it. Don't know about the first game, but the sequel has similar weapons filed under "Bomber Supression Missile[s]" — Awesome, but Impractical, as it's nearly impossible to hit any bombers with those. Suprisingly, however, they are very effective against enemy cruisers, which are too slow to escape the blasts, but low-armored enough for the missiles to do a lot of damage. Gunman Chronicles has grenade launcher, which, after some upgrades, may fire laser tripmines releasing a number of explosive balls on activation. Homeworld 2 brings us the Higaaran Torpedo Frigate, whose torpedoes travel towards a target at a certain distance before splitting into four small, but quick and agile missiles that chase down said target. The Recursive Ammo serves as as a deterrent against targets that are smaller than the Frigate itself. If the target is destroyed before all four hit, any missiles which are left will try to find another target to kill. Gunbound has this with the Kalsiddon. Shots are fired normally until they split apart into two or four missiles and a homing beacon. The SuperShot compounds this by having the shot split into 4 missiles and a beacon, and then each of those missiles split into two with their own beacons. All 8 shots hitting will cause extreme damage. Project Sylpheed enables you to shoot missiles that shoot missiles. They each lock on to their own individual target. FunOrb Arcanists have the Arcane Bomb, a grenade that releases three projectiles when it explodes. The Rogue Squadron games have cluster missiles on certain ships, which split into multiple projectiles when fired. Not quite as useful as a single missile until you pick up the Homing upgrade, which then allows the missiles to wipe out entire squadrons of TIE Fighters in a single shot. Later games also give the Y-Wing's bombs a cluster effect, spreading the damage over a wider area. Thugly from Donkey Kong Country Returns takes this Up to Eleven- he spits out a fireball, which explodes into a Spread Shot of three. One of the three then explodes into three again, then one of those explodes into another three! Though not strictly ammunition, most of the Evil power enhancements in inFAMOUS do this. Most notably the grenades, which split apart when they launch, and the Megawatt hammer, which has six smaller balls of electricity trailing off of it. Half-Life 2 has an Abnormal Ammo variant — big mortar shells delivering several headcrabs who do the whole target-hunting part. XCOM Apocalypse has the Disruptor Multi-Bomb Launcher, which is Exactly What It Says on the Tin: it fires a single projectile that splits into four smaller bomblets. You can also Game Mod other weapons into having Recursive Ammo, in theory. Wing Commander Prophecy and its sequel Secret Ops has the Tracker missile, which consists of four Friend or Foe missiles mounted to a common frame, that break off after running a certain distance to allow the individual missiles to track on whatever target meets their targeting parameters. The Ratchet & Clank series often has such weapons in their games, which include large bouncing mines that explode into smaller ones (Bouncer , Going Commando), rocket launchers that have missiles fly out on impact (Annihilator, when leveled to V5 , Up Your Arsenal), or a bomb that you throw at enemies that explodes into miniature bouncing bomblets (Constructo Bomb with the Barrage Mod , A Crack in Time). The most extreme version is the fully upgraded Heavy Bouncer from Ratchet & Clank (2016): it fires a large bomb that explodes into smaller bombs, which explode into smaller bombs, and then they further explode into smaller bombs. It's one of the few weapons that's equally efficient at clearing out crowds of weak enemies or annihilating single strong enemies. Crimsonland. The Splitter Gun's bullets split whenever they hit, causing mayhem on a screen. However, it's the only weapon that can kill you. Kommie Kong/Gorillazilla from Heavy Weapon has "Bursting Rockets", where he throws rockets that burst into six shots. Gods Eater Burst allows you to take this to ridiculous levels with its bullet creation system. It is entirely possible to make bullets that shoot bombs that shoot more bullets that shoot lasers and lightning. Star Trek: Shattered Universe, a space simulator game set in the Mirror Universe, has a Federation attack shuttle which fires torpedoes that split into six smaller torpedoes. One volley is usually enough to bring down another fighter. It is the most powerful player ship in the game. Cluster torpedoes, which fire like normal torpedoes but split into a medium sized but extremely dense (normal mines deploy 4 in an area about as big as a ship this deploys 20+ in that same area) auto armed mine field (the mines the track in to the target). The Bio-neural Warhead, a large tricobalt torpedo with point-defense turrets. The Variable Auto-Targeting Armament, the unique console of the Starfleet Avenger-class battlecruiser. VATA fires a pair of missiles whose effect and submunition vary by which cruiser command is active on the Avenger. The shield booster command causes the VATA to shoot tachyon beams that damage shields, and do an Area of Effect shield debuff when they hit. The weapon efficiency command makes it shoot quantum torpedoes and hit for pure kinetic damage. The maneuvering booster command turns both into chroniton weapons, which do damage and debuff speed and maneuvering. The Klingon Mogh-class, stats-wise a clone of the Avenger, has a similar console. Super Robot Wars Original Generation has the Split Missile, most famously used by Alteisen and Weissritter, which is a missile that breaks apart to reveal mini-missiles. The Shadow-Mirrors also use a version called the Matrix Missile in their Randgriths and Laz Angriffs. The Wild Falken and Vegalion have versions that are Herd Hitting Attacks. Tribes: Ascend has the MIRV Launcher, a large handheld mortar which fires a small shell that explodes into multiple submunitions after about a second, covering a whole area in big blue explosions of doom. In Escape Velocity Nova, the two most powerful Polaris capital ships mount a weapon known as the multi-torpedo. A decent salvo of these will reduce entire fleets to free hydrogen. The X-Universe calls them swarm missiles. They run the gamut from worthless (Cyclone missile; although it fires a single warhead at first, it will split up into several of them if it misses its target) to dangerously effective (Tornado missile, Typhoon missile) all the way up to Game Breakingly powerful (Shadow missile). The Flail Anti-Air missile used by missile frigates also possess the ability to select a new target if the existing one is destroyed; when combined with the frigates ability to simultaneously fire 16 Flails which individual split into 8 missiles a piece, things can get silly. Fallout 3 has the Experimental MIRV, which acts a lot like a shotgun that fires 8 mini-nukes in a single shot. It's considered Awesome, but Impractical mainly because mini-nukes are a rather rare ammo type (there are less than 30 to be found in the entire game) and only Super Mutant Behemoths can survive being hit with one. Fallout: New Vegas DLC the "Gun Runners Arsenal is a DLC that adds many new guns and Ammo types. To make up for the lack of mini-nukes available in the base game, the DLC includes four new fun flavors of these miniature atomic bombs that you can buy, and a great new nuke catapult named "Esther" to launch them from. One of these new mini nukes, the tiny tots variant, is a mini nuke that splits up and becomes several more nukes. At range, this ammo type functions like a normal cluster bomb, pepping a wide area with several mini-mini nukes to kill a bigger region of mooks. This ammo also makes the nuke catapult a viable close range weapon as the sub munitions can be detonated at relatively close range without being harmed, so you effectively have a nuclear shot gun. To top it off the Tiny tots nuke only costs the same as a normal mini-nuke, (assuming that people actually sold normal mini nukes). Fallout 4 has the Legendary weapon ability Two Shot. Each shot launches two projectiles but only costs one round of ammo with a slight decrease in accuracy. One of the vendors sells a unique Fat Man named Big Boy that comes with this property. And the Fat Man, including Big Boy, can be equipped with the MIRV weapon mod, which changes it from firing a single large bomb to eight tiny submunitions. Unless the weapon already has the Two Shot property, in which case it causes it to fire twelve bomblets at once. StarTropics has the Four-star. A throwing star that goes forward and then splits into four stars that fire in all four directions. Postal 2's "A Week in Paradise" mod does like the Call of Duty 4 cheat mentioned above: One of the new weapons is an extremely dangerous explosive called the "Jihad Grenade". Play in Enhanced mode, and it splits into five grenades shortly after being tossed. Aurora lets you design missiles and add an optional payload to turn it into a MIRV missile or Mine. Said payload could also be an MIRV missile or mine, so you can get Missiles shooting Missiles shooting Mines that shoot Missiles. In Infinite Space, MRV and Cluster Missiles can be seen to split apart shortly after launch. They allow you to hit an entire enemy fleet with each volley instead of just one ship. Best when combined with the Formation Foe skill. Master of Orion 2 missiles can be upgraded with MRV warheads after additional research, though the only visible effect is increased damage, price and weight. G-Police has the Star missile. Upon firing it it instantly separates into eight smaller rockets that then all but Hitscan on the target. It's less of a rocket and more of a cannon, really. Rage has Killburst ammo for the pistol. It's unclear exactly how they work, even with the reload animation that shows the magazine being inserted. The Gullwing in P.N.03 splits into smaller energy balls on impact with a target. The version of Dark Firaga used in Kingdom Hearts 3D launches a fireball that travels in a straight line until it nears a foe, at which point it splits into a multitude of homing fireballs that converge on the target. The Ryu Dragon and Tatsu Blaze dream eaters also have attacks of this nature, both being capable of launching fireballs that split into over a dozen more and scatter destruction over a huge area. There's also Spark Raid, which splits into rays of light, and the Balloonga spell, which conjures a massive homing water balloon that explodes on impact into six smaller, faster ones. In Bloons TD 5, the Bomb Tower's path 1 tier 3 upgrade shoots bombs each contain 8 more bombs. Angry Birds: The Blue Bird splits into three on command. The Naval Ops (AKA, Warship Gunner) games featured a few of these weapons, notably the cluster missile and splitting laser. They tended to be Awesome, but Impractical as they split too wide between individual projectiles and fired too slowly to really provide decent saturation attacks. Monster Hunter: One of the ranged weapon classes (for a while the only ranged class) is the Bowgun, a hybrid gunpowder-crossbow that launches various forms of capsule-arrows containing anything from sticky bombs to shotgun shells to paintballs. Most of them exit their casings only after they've left the barrel. Portal: A promotional video mentions that the turrets encountered in game "fire the WHOLE bullet, that's 65% more bullet per bullet". For the sake of comedy, some of the cartridges end up discharging on impact in the video and sending the bullet and cartridge in different directions, but this never happens in-game. Sid Meiers Alpha Centauri: When a unit is designed, most of the weapons which can be chosen for it are a laser of some kind, and all of them can be made into artillery. Twisted Metal 4 had the Rain Missile, Rain 2 Missile, MIRV and Auto Lob. In typical TM 4 fashion, they all did about the same thing, and one of them (or two?) fired lasers. In the original PlanetSide 1, all empires had access to the Scorpion missile launcher. Users would aim, right click somewhere to set that as the detonation distance, then aim above entrenched enemy positions and fire the missile, which would burst at the set distance and rain shrapnel down on the enemy for massive damage. The weapon was almost universally regarded as a Scrappy Weapon as it required trigonometry to use and the Goldilocks zone for detonation was especially finicky. Mercenaries has a cluster bomb airstrike you can purchase from the Russian Mafia run Merchant of Menace. One of the Naegling Self-Propelled Rocket Tanks has a variant that fires missiles that split into a swarm of smaller missiles. One of the Fencers missile variants fires missiles that shower an area with bomblets. There are a few variants of Fencer Artillery that eject explosive bombs along its flight path. In MechWarrior Living Legends, some Attacker and Bomber-type aerospace fighters have access to Cluster Bombs that drop multiple low-damage bombs across a wide area, sanding off armor on multiple units, but lacking the oomph of the High Explosive bomb or precision of the Laser Guided bomb. The "Agent Orange" Shiva heavy bomber takes area denial to its logical conclusion, as it can drop 60 cluster bombs in a pass while firing its 80 medium range dumbfire missiles and twin rotary autocannons. The Chiquita Bomb from Liero. With reload time set to 0% you can easily fill the map with explosions. Scorched Earth has two examples. MIRV which separates into few bombs in-flight, and Funky Bomb which, on impact, creates a big explosion and showers the surrounding area with smaller bombs. TAGAP 3 has a MIRV-shooting rocket launcher. You can choose whether the MIRV separates mid-flight into three homing sub-missiles, or not. For some reason, the second option causes a much bigger explosion than the aforementioned three sub-missiles combined, but inflicts less damage. Manly Guys Doing Manly Things: This episode features an action figure whose gun shoots little guns. The little guns "might shoot deep fried beer cans or somethin' ". Darn, they got rid of it. Thank you, Internet Archive! 2076. If I'm commissioned to build an artillery gun, they don't mean a gun that fires howitzers. Ricochet Rabbit had several trick bullets, one of which would stop in front of the bad guy, pop open, and pull out its own gun to shoot. The Simpsons: In one episode, Nelson was drawing a robot with guns for arms fighting a plane made out of guns that shoots guns. In the original Duck Dodgers in the 24½th Century short, Marvin the Martian's "Ultimatum Responder" gun fires a bullet that fires another bullet right in Daffy Duck's face. The first widely used example was probably the shrapnel shell, which used a timed fuse to trigger a small explosive charge within that would deploy its payload of musket balls. So it was basically a giant shotgun launched from a cannon and rigged to shoot the enemy from over their heads. It was invented by Henry Shrapnel, whose name became a word we use to this day. MIRVs, a Nuclear cluster bomb. And missiles that attack like cluster bombs. Explosively formed projectiles when launched from a rocket. 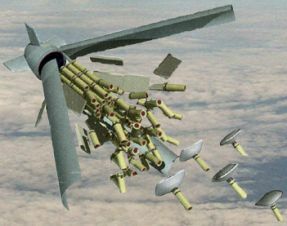 Sensor fused weapon which is a smarter version of the cluster bomb. FASCAM (Field Artillery SCAtterable Mines), AKA "instant minefield", similar to the Generals reference above. The military once experimented with a bomb that opened up to reveal... a swarm of bats. Little kamikaze bats with little incendiary bombs strapped to them. The idea was to drop these over Japan — most Japanese buildings being mainly made of wood. By the morning bats roost on or near important buildings, then timed bombs go off. The Absurdity Ascendant part? The little incident where the bats escaped and took refuge in buildings all across the military base where they were held, followed by a flawless demonstration of the weapon's destructive potential. This actually convinced doubters that this was not in fact as stupid as it sounds: it was clearly effective enough for a single unit to devastate a moderately sized military base. The bat bomb, however, was not to be. The more expensive (and equally absurd-sounding at that time) Atomic Bomb was finished first and didn't accidentally go off on a friendly base, so the batty project quickly fell into obscurity despite having a handfull of enthusiastic supporters in the military. The Strategic Defence Initiative postulated a design for "Excalibur", a nuclear warhead powering a bunch of x-ray lasers, which inspired the Honor Harrington example above. It was never built as a finished weapon due to having a few problems on top of issues with SDI in general. In their early experiments with gunpowder, the Chinese invented a rocket that shoots smaller rockets. The large rocket was shaped like a dragon, and the smaller missiles emerged from its mouth. It probably freaked the hell out of their enemies. The MythBusters tested this one. Verdict: Plausible, but not the most reliable weapon. A modern example of the above is the Starstreak missile which launches three laser guided 'darts' to increase the chances of a hit. A thermonuclear bomb (Hydrogen or H-bomb) is quite a bit more powerful than a traditional atomic bomb. How much so? The H-bomb has an A-bomb as a trigger. The traditional cluster bomb, releasing dozens or hundreds of grenade-sized submunitions, has been the subject of a 2008 limitation treaty, mainly because the high percentage of submunitions that go dud on impact like to stay around to make life miserable for quite a while. Notably, the US, China, and Russia are not signatories, and careful Loophole Abuse—fully deliberate—reveals that modern "smart" submunitions are exempt as long as they meet a number of criteria: bigger than 4kg, no more than 10 to a container, and have two self-disabling/self-destruct devices in case it doesn't hit anything. This makes sense, since the main purpose is to make sure they don't hang around like an unplanned minefield after the war's over. As a response to the above, even though not truly bound by it, the US Army has developed the world's largest shotgun shell under the Alternative Weapon Program. Fired from the MLRS rocket system it uses 800 tungsten rods to achieve much the same effect as a conventional cluster bomb but without the unplanned minefields. A similar bomb exists, though with a mix of steel and tungsten and it is intended to attack targets in cities such as fuel storage or chemical weapons without hurting anyone else. The Bombkapsel 90 is not a cluster bomb, but a Dispenser Weapon System. Or, as the The Other Wiki calls it, a cluster bomb. The GT-1, a glide bomb that could be dropped 20 miles away from the target at 10,000 feet. The bomb would gently glide down, and once it was just above the water, it released a Mark 13 torpedo. Similarly, the ASROC, an anti-submarine weapon consisting of a ship-fired missile that dropped a homing torpedo. An example in computer security is a Forkbomb, which is a program that simply launches another instance of itself.note "Fork" is the UNIX command a process uses to launch another instance of itself. The copies then launch copies, increasingly consuming the computer's resources until it eventually crashes. A similar attack on XML servers is known as the Billion Laughs Attack, which uses XML entities to exponentially recreate a string (usually "lol", thus the name), again consuming memory.